The entire solution was integrated and deployed within few hours of effort spread over a week. Chaudhary Charan Singh University (formerly, Meerut University), a premier educational institute in the country, was established in 1965 to cater to the needs of higher education in western Uttar Pradesh. CCSU has more than 6,00,000 students enrolled in more than 50 courses. There are more than 400 colleges affiliated to the University. The average annual fee paid per student ranges from Rs 500 to Rs 5000 across various undergraduate and post-graduate courses. The total fees collected by the institute in a year adds up to approximately 100 crores. CCSU collects this fees in five different bank accounts through both online and offline channels, making it a tedious process from accounting and management viewpoint. An issue related to this is the cost of overheads for managing this process and risks associated with cash management. Second problem faced by the institute was related to tracking of duplicate payments and subsequent refunds to students. This problem resulted due to technical issues/limitations of the website. Further, refund processing used to take as long as six months. In the third scenario, during the fees cycle, when innumerable students were using the bank’s payment gateway, the bank’s website often experienced downtime. This interrupted the fee payment process leading to unwanted delays. CCSU wanted an integrated solution to address all these problems without increasing any overheads. PayU deployed a comprehensive solution at CCSU to efficiently manage the problems faced by CCSU. As a result, more than 95 percent of the fees is collected through online mode and through PayU. A keyword sensitive payment system was introduced which automated the routing of fees to desired bank account. The moment a student enters the name of a course or the year of education, PayU directs the fees to one of the five bank accounts of CCSU as per the pre-determined rules. This enabled faster and hassle-free management of cash in various accounts and also substantially improved the tracking of funds through dashboards and multiple reports. PayU resolved the payment duplication problem by effectively tracking fees paid by each student and streamlined the refund process, reducing the refund cycle from six months to less than a month. To resolve the problem of bank’s website downtime, PayU activated multiple payment gateways with CCSU and developed an intelligent algorithm based software that can detect the health of a payment gateway and dynamically route the payment through the best channel, ensuring high success rates. PayU has also set up a Merchant Relationship Management (MRM) team to help CCSU and its students with their queries, ensuring smooth payment processes. This team resolves more than 90% of the queries or issues over the phone at the same time and the remaining queries including technical issues are resolved within few hours. Additionally, CCSU has been provided with a customizable dashboard to keep a track of each and every online transaction, ensuring much greater accountability and, easy and faster reporting. Cashless fee payment reducing the risks associated with cash management. Reduced administrative cost through ready-to-use online reports. Higher accuracy and hassle-free reconciliation through a comprehensive dashboard. Instant money transfer to the desired bank. Higher success rates and faster refunds. Easy and quick fee payment at “anytime anywhere”. PayU is India’s leading payment gateway solution provider, authorized by RBI, specializing in education fee collection. It serves more than 140,000 businesses including some of the leading educational institutions in the country. PayU is part of multi-billion dollars NASPERS group which is listed on London and Johannesburg stock exchanges. 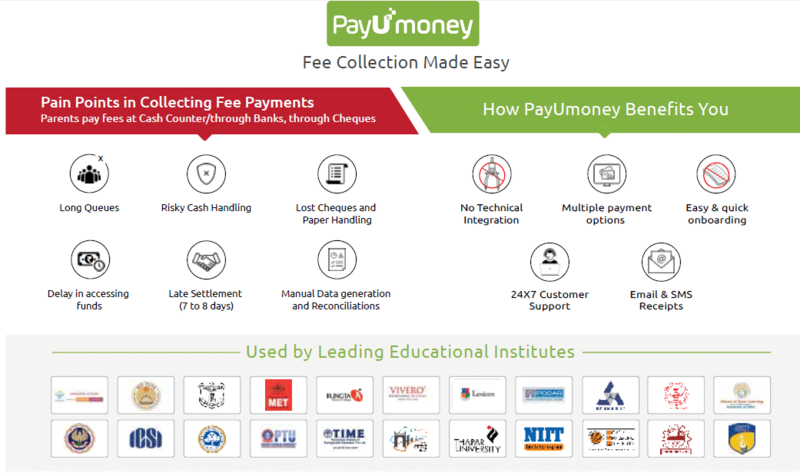 PayU offers fee collection solution to all types of educational institutions such as pre-schools, schools, colleges, universities, boards, exam conducting bodies, coaching institutes etc. PayU has also helped institutes which do not have any technical team or website to start collecting fees online within few days.